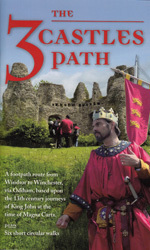 The Three Castles Path is a long distance route from Windsor to Winchester, providing 60 miles of easy walking through peaceful historic and beautiful countryside. The idea for this route was inspired by the well documented 13th century journeys of King John between Windsor Castle and Winchester, via the castle he built near Odiham in Magna Carta times. A straight line drawn on the map joins these three historic places, with Odiham exactly half way. While many aspects of the countryside have altered dramatically in the 800 years since John's time, the contours are unchanged and the route uses some of the old ways that he would have known. Today the route still passes through a variety of attractive scenery; parkland and forest, over heaths and downland, beside quiet streams and through picturesque villages. Despite recent developments the route mainly follows a continuous chain of rights of way. With the addition of some permitted paths through Crown Estate woodland the route is completed using less than five miles of mainly unclassified roads. This is not a strenuous walk and can be planned in stages over 3 to 5 days depending upon fitness and inclination. There are few steep hills to climb, not that many stiles and rarely much mud, making the route ideal for a first long distance path. The route has good rail connections at the start, middle and end. The guidebook breaks the route down into 15 short sections, each on a two page spread of the book. For information and planning these are shown below.